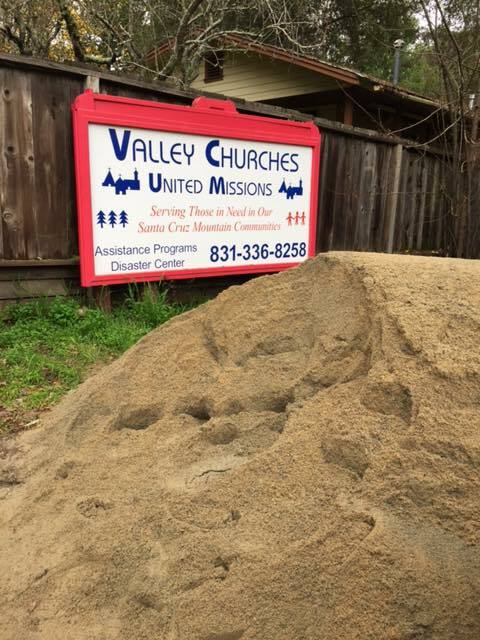 Whenever a big storm is forecast, we provide sand and sand bags–just in case. 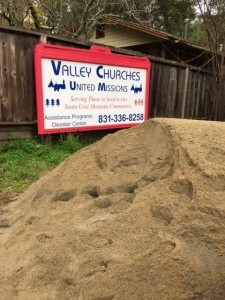 Besides the 1982 floods, Valley Churches United Missions provided aid in the aftermath of the 1989 Loma Prieta earthquake which caused devastating property loss throughout our area. VCUM opened a disaster center that channeled over $500,000 in items and cash donations to 3042 earthquake victims. In 1998, El Nino storms struck once again, and once again VCUM became a disaster center for storm victims. Despite our own facility being flooded (with a loss of over $60,000 in food and supplies), VCUM carried on, providing direct aid to residents affected by flood and mudslides.